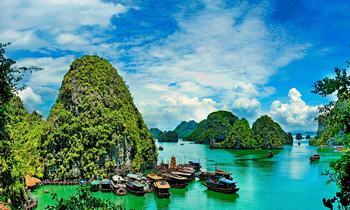 Hanoi and Halong are among the most famous sites in North Vietnam with various attractions. 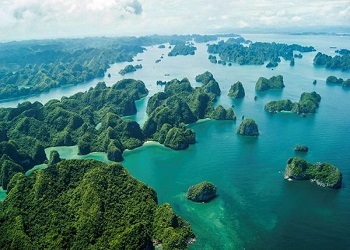 In the article, we will guide you with the best ways to reach Halong Bay from Hanoi. Passenger bus is the cheapest way for travelers, especially very ideal for foreigners to learn about the local life of people here. The travel time is around 4 hours from many bus stations in Hanoi like Luong Yen, My Dinh, Gia Lam to Bai Chay bus station, Halong city, Quang Ninh province. 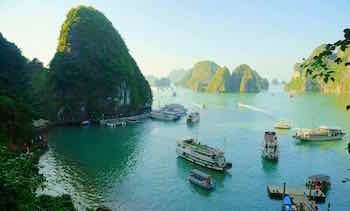 Depending on different seasons, destinations, and types of ticket, it will take guests from VND 100,000 to VND 150,000/guest. On the other hand, the passenger bus has many disadvantages related to fewer selections and the difficulty of interacting with drivers. Also, in cases of bus failure or misses, the trip of guests will be totally affected. 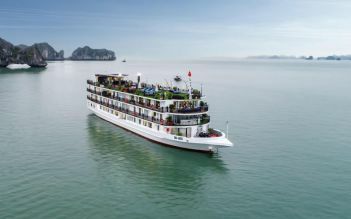 Therefore, if tourists only have one day to discover Halong, they should choose other options instead of going by passenger bus. 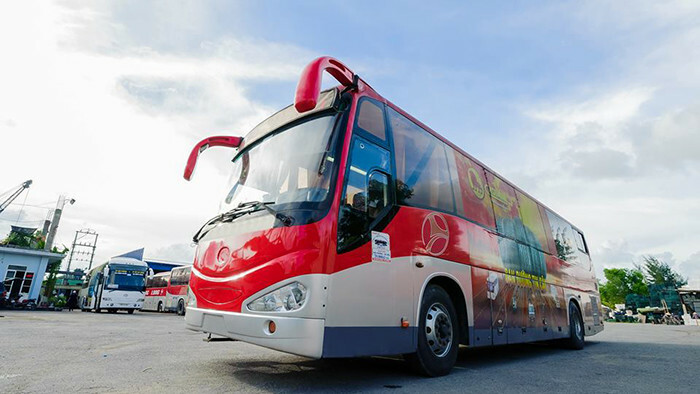 Some famous and reputable passenger bus lines in Hanoi and Halong for visitors include Hoang Long, Phuc Xuyen, Quy Ngoc, Kim Lien, and Sinh Thanh. The minivan is a bit costly compared to the passenger bus, but tourists will be extremely comfortable and convenient. In a more advantageous level, it is assured about punctuality and experience. The ticket price is about VND 160,000-240,000/guest. 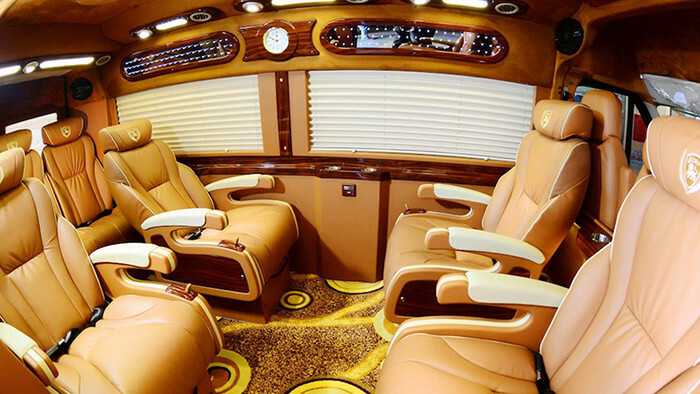 Commonly, the limousine will pick tourists from many sites around Hanoi Old Quarter, the office of the travel agencies, and even from your accommodation in the capital. 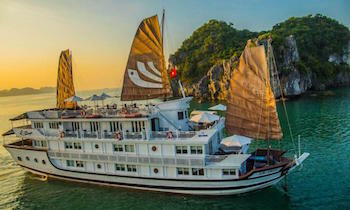 With this kind of transportation, travelers will be picked up to return to Hanoi after the one-day journey in Halong Bay as well. 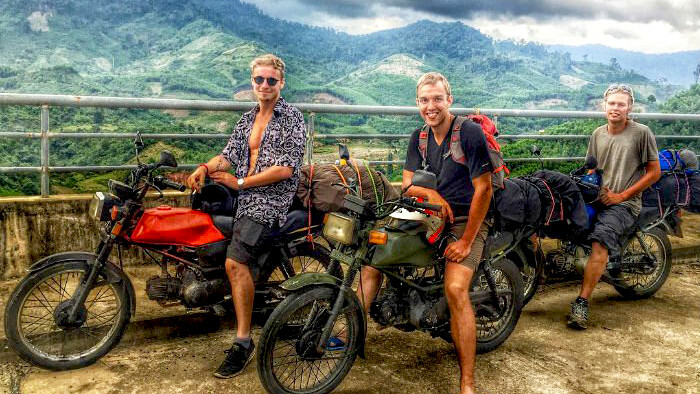 For those who like to travel and explore, motorbike and car are the two most appropriate means of transportation to go from Hanoi to Halong Bay. Tourist will have a chance to admire beautiful scenery along the way, as well as stop by any destinations they want, thus they will not be bound by time and schedule. In Hanoi Old Quarter, travelers can find various rental shops of means, from Ta Hien to Hang Thung, Hang Bac streets. Lang street is also an ideal place to rent a motorbike or a car. The price of renting a motorcycle ranges from VND 100,000-200,000/day and for renting a car is about VND 1,500,000-2,200,000/day. There are 3 routes for travelers, which take about 3-4 hours. The fastest route goes through Bac Ninh province that travelers go along Highway 5 to Sai Dong junction, turn to Highway 1 to Bac Ninh, then go along Highway 18 through Pha Lai, Chi Linh, Dong Trieu, and Uong Bi to Halong city. The second way goes through Hai Duong city along Highway of Hanoi - Hai Duong to Nam Sach town, then turn to Highway 183 through Sao Do town, Dong Trieu, and Uong Bi to Halong. The final one goes through Hai Duong to Quan Toan (Haiphong), turn to Highway 10 and Highway 18A to Halong city. 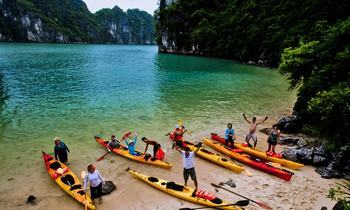 Taxi is more suitable for a group of 4-8 people wanting to travel to Halong in limited time. Because this is not the most economical option, traveling in a group will help tourists save more money when sharing the total costs. Travel time is around 3-4 hours. Basically, there are various taxi companies operating packages to pick travelers up from Noi Bai Airport, Hanoi to Halong with a more reasonable price. Therefore, it is also very convenient compared to other means. Mai Linh, Taxi Group, Sao Hanoi, and Taxi Noi Bai are among the best ones for tourists. The prices of these lines going from Hanoi to Halong Bay are listed as below. For foreign travelers, traveling by train in Vietnam has become a wonderful experience with the advantages of easy buying, cheap price, fun space, and interesting roadside scene. Tourists can book online tickets and print later at the railway station or buy directly at the station. Notice that travelers should buy them early on the holidays to avoid being out of the ticket or lining up for too long. The Halong Express train departs from Gia Lam Station (Hanoi) to Halong Station (Quang Ninh) at 7:05 AM to serve tourists from Hanoi to Halong. 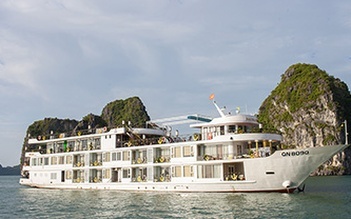 To return to Hanoi, it departs at 3:00 PM from Halong Station. The train consists of 6 carriages, each with 62 soft seats and 1 carriage serving the need of a bar and food. 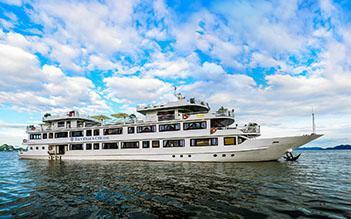 Traveling by Halong Express takes travelers less than 2 hours. 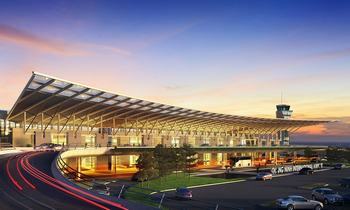 Fares for foreign guests are 15 USD and domestic guests are 5 USD. 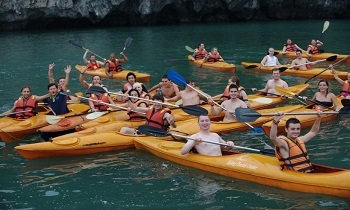 With our top-to-toe Halong guides, hope your trip to Halong from Hanoi will be more convenient and easier than ever. For further information, feel free to contact us or visit our website. Don’t forget to like and share the article if it’s useful for you. Thank you.